Howdy, Protagonists. It’s that time again. Anyhow, on with the news this week! We’ve had a great week for both content and new users, and I think you guys all deserve a big thank you for contributing some excellent fiction this week! Our two previous features are all still planted firmly in the top 5 Hot Stories, and I had a helluva time picking this week’s features. I think next week may be even tougher, with the quality stories posted over the course of the last couple of days. This week’s featured story is “Joyride“, a linear story by veteran Protagonize author Gaelythe, who was a featured author at the end of January. I almost chose this story as last week’s Editor’s Pick, but it had only just been posted, so I put it on hold for a week. “Joyride” has accumulated an 5 intense chapters from 3 different authors, as well as an amazing 15 comments from readers. The quality of the story thus far is a joy to behold (and I’m not patting myself on the back here, either — I couldn’t resist but contribute to the story myself) and I hope it’ll keep going strong for the next few weeks! Two sets of three silvery disks, that was all it had taken to ruin Aaron’s life. He knew he wasn’t free of blame, not entirely. He’d known the risks. He’d needed the money to save his daughter, and the risks hadn’t mattered. Most Joyriders didn’t usually do that much damage anyway. They leaped into the body they’d rented for an hour or a day and headed straight for a sexual encounter or their drug of choice. The Joyride let them feed their vices without consequence. Reputations (often vital in the Corporacracy) were undamaged, addiction and subsequent detox were avoided. This week’s featured author is Amo1143, who’s posted 4 stories and 12 branches, including our Editor’s Pick from two weeks back, “Drop Point.” With 46 ratings as of this writing, her stories are averaging a spectacular rating of 4.7 (out of 5) overall. I’ve spent this week getting accustomed to my new digs at my day job, but I managed to sneak in a few usability enhancements throughout the site, as well as a new e-mail notification type. I have a couple more tweaks to existing functionality in store for this week, as well as a couple of smaller (yet noticeable) new features. I’ll save those for next week’s email. 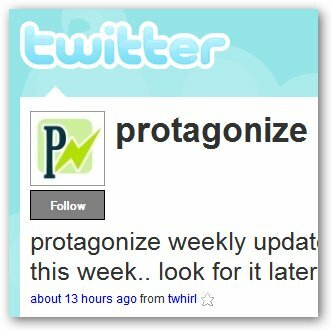 That’s a wrap for this week — check back next Monday for another Protagonize weekly roundup! In the meantime, please spread the word about Protagonize (hit that “share” link on our Facebook product page and get your friends to sign up! ), and be sure sign up on the site and subscribe to our blog’s RSS feed! This entry was posted in Features, General, Site updates, weekly roundup. Bookmark the permalink.